The natural charm and the beauty wood offers cannot be compared to anything else. If you are renovating your house or building one from scratch, you should consider adding wood soffits to the building plan. Wood soffit have a natural elegance and offer the sensation of a dreamy sunny day. If you want to make a statement of you simply want to live surrounded by beauty and charm, then read further to find out about the advantages our wood soffit offer. The wood soffit we work with are versatile products designed to suit your taste and compliment your individuality. They are available in 6 vibrant and lush pre-finished colours, from American Nut Brown to Texas Honey Brown and Belgian White Ale. Since Gut-R-Dun works only with premium suppliers, the wood soffit we install have a warranty of 10 years. Another benefit of wood is that it increases the market value of your house. And, if you are environmentally conscious, then we have great news for you: Unlike other material for soffit, wood soffit are 100% renewable. 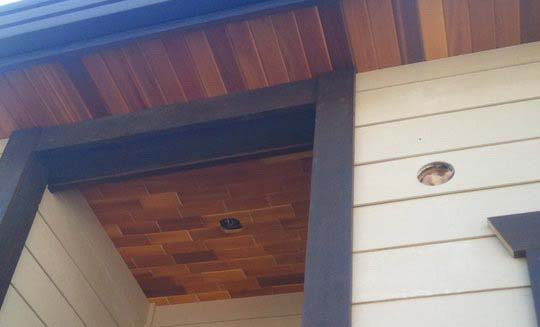 If you live in Kelowna or Vernon, then give us a call, and we will install your beautiful wood soffit to your elegant house. Gut-R-Dun is specialized in exterior services and works only with high-quality suppliers. Our policy is quality. Regardless of what you want us to do for you, from the moment we start we are 100% dedicated to the job. We are the experts you want to work with you if value quality and beauty as much as we do. Contact us, and we will install spectacular wood soffit to your house that will offer it a timeless look, making all your neighbours jealous of your beautiful house.